In 2012 the Council for Culture issued a positive advice on the policy plan Creativity as Necessity, the founding document of Het Nieuwe Instituut, on the condition that the institution provide a supplementary plan in 2013. This plan has since been approved by the Council. A detailed summary can be downloaded in PDF format. The policy plan gives an insight into the ambitions of Het Nieuwe Instituut, developed along three long-term programme tracks, covering the themes of matter (Things and Materials), space (Landscape and Interior) and time (themes that are connected to the current calendar year). These themes form the foundation for an integrated programme on architecture, design, digital culture, supplemented with a series of multidisciplinary projects. 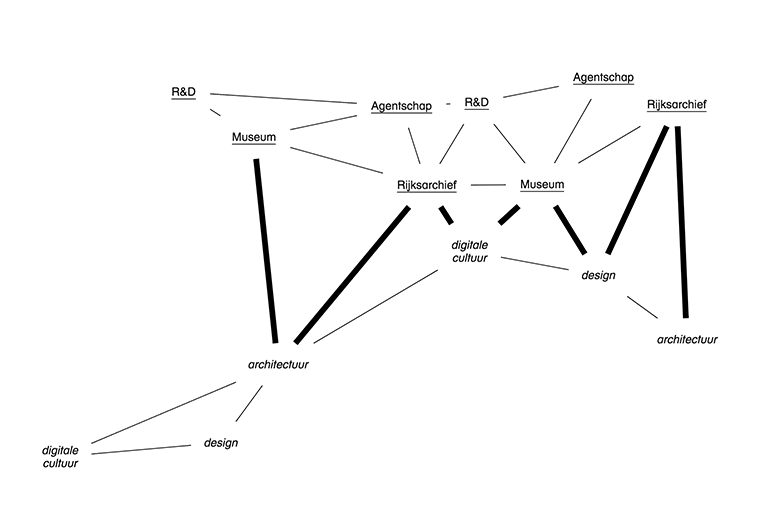 Het Nieuwe Instituut came into being on 1 January 2013, when the Netherlands Architecture Institute: Premsela, the Netherlands Institute for Design and Fashion; and Virtueel Platform, the e-culture knowledge institute, merged. The merger was the result of the plan More than quality: a new vision on cultural policy by State Secretary for Culture Halbe Zijlstra (June 10, 2011). Combining various design disciplines in one institution is in line with his vision for the interaction between the fields in the cultural sector.